Entire system built to handle large flats and envelopes. The heavy-duty PostMark 3056 Letter Opener is an extremely productive machine that can overcome any amount of demands. It is capable to open up to 32,000 small to large envelopes per hour, providing a very efficient work environment. The 3056 letter opener cuts and removes up to 3mm (1/8") of the envelope edge, preventing from damaging the contents and materials. 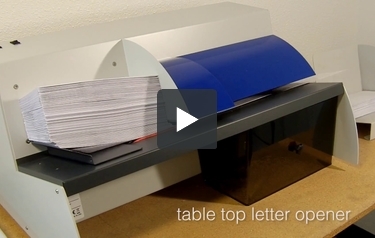 The feeder can handle up to a stack of 100 envelopes at a time creating a constant productive work flow. The cutter creates a soft opening, preventing any paper cuts and at the same time, allow for a much easier access. The removed waste is collected in the waste bin as tiny chips. Present a clean and spotless environment. Work smarter with the PostMark 3056 Letter Opener. Milling Cutter Technology. Protects the contents from being cut or damaged. Removes up to 3mm (1/8") of the envelope edge. The removed material is in the form of tiny chips, which are deposited in the waste bin. Creates a soft, feathered edge opening, which prevents paper cuts and gives easy access to the contents. Mixed Thickness Separator. This separator design ensures that only one envelope passes through the machine at a time maximizing separation and improving cut quality. High Speed. Opens up to 24,000 envelopes per hour. Opens mixed mail, from the smallest to the largest, completely. Opens up to 6mm (1/4") thick envelopes. Entire system built to handle large flats and envelopes. Simple and Reliable. High degree of operational reliability. Heavy Duty. Solid metal construction throughout. Made of steel using the highest quality of components. Has two motors for better performance and a longer life. Length: 28 inches / 710 mm. Depth: 18 inches / 463 mm. Power: 115V/60 hz or 220V/50 hz ( 2 motors x 60 watts). Speed: Theoretical speed (RPM): 32 ,000 envelopes per hour. Production Speed: 8,000 per hours based upon a normal human being working 8 hours a day. Should you have a trained Octopus as an operator, please revert to above RPM! Envelope Size: All sizes and types. Maximum Thickness: 1/3" - 8 mm. Depth of Cut: From 0 (no cut) to 0.125 inch/ 3mm. Feeder Capacity: Approx. 100 envelopes. Receiving tray capacity: Approx. 100. Stand and Waste Drawer Table-top thus no stand. Waste drawer is included. Table top letter opener. Mixed thickness separator. Solid metal construction. Milling cutter technology, clean cut, contents unharmed. Removable chaff bin. Mixed mail. Flats and large envelopes. Welcome to MyBinding Video. 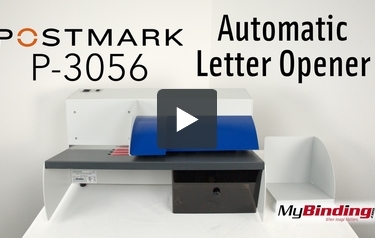 This is the P-3056 Automatic Letter Opener from Postmark. This letter opener is unbelievably efficient, being able to open up to 32,000 envelopes per hour. With the feeding side able to hold around 100 envelopes at a time, you’ll still have to work quickly to keep up with how fast this letter opener works. Milling Cutter Technology protects the contents of the envelope from being damaged in any way. The cutter removes up to 3mm of the envelope edge and actually creates a soft, feathered edge that prevents paper cuts. This letter opener is made with the highest quality components and is backed up with a 1 year manufacturers warranty. For more videos and all your binding needs, visit MyBinding.com. Thank you for your question. During the warranty period you would work with the manufacturer Postmark. For out of warranty support, we are based out of Oregon, our service area is OR,WA, most of IL and southern CA. If you are in one of those areas contact us and we can set up a service call. If you are not in our service area we would refer you to a 3rd party nation wide service provider Serv Right, their phone # is 1-800-642-6015.